West Midlands Vegan Festival - why vegan? 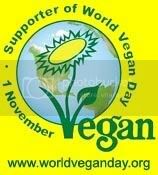 World Vegan Day celebrations start early again this year! Don't miss the 10th West Midlands Vegan Festival on Sat 28th & Sun 29th October! Click here for map etc. Veganism takes all those advantages a whole lot further. For very many people concerned about any or all of these problems, it seems the natural step to take from vegetarianism. In the UK alone, 850 million animals and hundreds of millions of fish are killed every year to put meat on tables - that?s more than three million animals a day. Before they are slaughtered, hundreds of millions lead desolate, disease-ridden lives on factory farms. Cattle reared for milk production are exploited and made to suffer, just like animals reared for meat. They suffer from lameness, mastitis (inflammation of the udders) and other illnesses and - worst of all - they are forcibly separated from their calves just days after they are born so that humans can drink their milk. Cows are not some kind of special animal that produces milk automatically: just like every other animal, including us, they only produce milk to nurse their young. Male dairy calves, meanwhile, are useless to the dairy industry and are usually shot at birth. Meanwhile, egg-laying hens may be crammed into battery cages or disgusting, disease ridden percheries and forced to produce twenty times the number of eggs as are natural to them. Even free range and organic layers face disease and parasites - and are slaughtered for cheap meat as soon as their productivity falls below the level that the egg business will accept. Male chicks are as useless to the industry as male dairy calves and all are killed - including those on free-range and organic systems. Like leather, wool is a vital part of the profitability of the meat business - and animals suffer to produce it. Over 90% of British sheep flocks have problems with lameness and almost 1 in 5 lambs die before getting to market. Even honey bees are prone to infectious diseases and the ill-effects of intensive production. All animals kept for profit are exploited in one way or another: the only way to ensure that animals are not harmed is to ensure they are not farmed at all. Vegetarians live longer and suffer less from diseases such as hypertension, obesity, coronary artery disease, certain kinds of cancer and diabetes. Vegetarian diets can even be used to treat illnesses. Human beings are the only animals which consume milk after infancy - and the milk of another species at that. It is neither natural nor healthy. A study published in 2003 found that a vegan diet could reduce the most harmful form of cholesterol by 29%. The American Dietetic Association has declared that a vegan diet can provide all the nutrition that human beings need - from cradle to grave. Veganism is infinitely closer to the diet human beings evolved to thrive on than a normal, animal fat-soaked western diet - and the health benefits of a well-balanced vegan diet reflect that. While 750 million people go to bed hungry every night, one-third of the world?s grain is fed to farmed animals. A typical Western meat-based diet can only feed 2.5 billion people: a plant-based diet will feed every one of us. Again, dairy cattle and laying hens are consuming resources that could go to feeding human beings. As the developing world increasingly industrialises its animal agriculture, farming animals in order to generate revenues instead of food that problem will get worse - and as more dairy and egg produce is consumed in the developing world, so its people are at risk of falling prey to the diet-induced illnesses of Western society. Rainforests are cleared for grazing; methane from livestock causes global warming; soil is eroded by cattle; slurry poisons waterways; and the seas are laid to waste by overfishing. The global appetite for meat and the industrial techniques of the meat industry are destroying the Earth. Dairy cattle and laying hens consume land, water and resources just like other farmed animals. They eat pesticide-soaked fodder, produce polluting slurry, consume chemicals and drugs produced at environmental cost and generate greenhouse gases. They are a drain on our resources that this planet cannot afford. A unique, online and mobile confectionery shop, which sells all your favourite vegan goodies! It's run by volunteers, with all profits ploughed into grassroots vegan outreach, including this festival!! The festival is organised by Midlands Vegan Campaigns, a small group of dedicated volunteers.